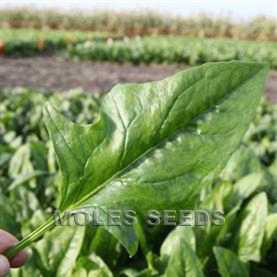 Oriental spinach with attractive serrated leaves. Thick leaves with a smooth leaf surface and dark green colour. Excellent flavour. Upright growth aids picking. Suitbale for baby, teen and bunching production. Suitable for sowing Janaury-March and October-December under glass. Mildew resistance 1-12,14,15.